That day Ridley had to reconvene at lunchtime in the office thinking about who they could get and he knew that John Hurt was in London at the time. Two days earlier John Hurt had been contracted to do Zulu Dawn in South Africa, and he was about to get a taxi to the airport when he received a phonecall saying that they weren't going to let him into South Africa and when they had to try and find out the reason, it seemed that he had been confused with the actor John Herd who was a political activist who had gone down on the South African books as an undesirable because he didn't believe in Apartheid, and so he then came back to England. 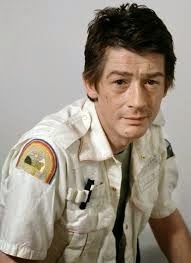 And so Ridley drove to John Hurt's home in Hampstead village to see him . They sat down with a drink, they talked until after midnight and Ridley gave a long and interesting pitch and John wouldn't have time to mull over it or decide this that or the other. It came to a point where Ridley said to him "Do you want this?" John replied, "Yeah, I trust you, when do I start"
John's response was "You'd better send the car round to take me down to the studio." Ridley's replied "A car will come for you"